The desert is a grueling waste and the best way to deal with it is spend as little time there as you can. For every three days the party travels in the desert their food and water needs will multiply. Each day the party will see features that they can choose to explore or ignore. Exploring them will require an extra day. The features that might be seen during each three-day-span are linked with dotted paths. Landmarks are tombs and ruins or ancient stelae which might hold riches in gold or ancient knowledge. An oasis will provide food, water, and shade to a party for as long as they like; will allow them to re-stock their supplies; and will reset their place on the chart to the start. Caravans can offer food, water, and unerring transport, but may also be hostile bandits or slavers. Unfortunately, 50% of the time any of these will be mirages. And 25% of the time they will be one of the other two features. Once a party member cannot meet the food and water requirements they must make a save each day to continue. Failing this save means they are unconscious. Each day they are unconscious they must save or die. Every landmark visited will offer a bonus against getting lost on subsequent journeys through the same area. Note: I probably should have put a couple check boxes for local guides or rangers that give you one free non-mirage. The idea here is that the desert becomes more and more deadly the more time players fiddle around in it. They may decide to strategically search for an oasis or caravan if supplies start running low. A DM would need to prepare several landmarks ahead of time. These could be anything from full blown dungeons to just obelisks. I envision using my trackless wastes chart to help players know where they think they are going. 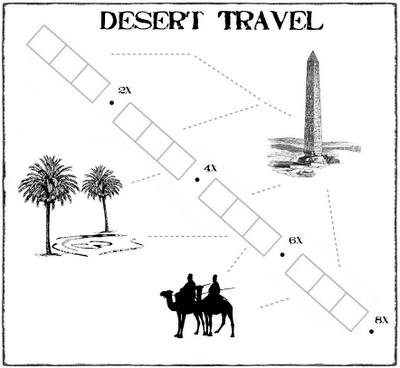 I also envision using this with the normal getting lost chances, which could make excursions into the desert very dangerous. I can imagine situations where a few tougher party members desperately seek out an oasis or caravan with all the rest of the party left behind, unconscious. I simplified the chart to three sections and lowered the multipliers to the still easy to remember but more believable 2,3, and 4x. I like this better, it looks cleaner. I would have the multipliers just apply to water now. I think it fits the tropes better. I also added the reminder boxes for rangers and locals getting one free I'm-certain-that-is-no-mirage per journey. (funny how I put rangers and druids and such on all these charts when I don't even use them in my campaign. I guess that is just me trying to be helpful to you all-- rangers, druids and equivalent situations-- players with magic items or special backgrounds-- should all work equally well on these simple rules). I was in the process of changing the three day increments to four but reverted them back, I think, while I had it too brutal before, it needs to feel like a dangerous and slippery slope-- four days of travel equivalent to just being on a normal road was a little too easy to do that in my opinion. Also, I don't think I ever mentioned that the whole dotted line mess isn't just for aesthetics, I was trying to limit when players might find certain things. I didn't want a party, fresh and confident, checking to see if every oasis is a mirage. But as things get desperate there are chances available to get out of the situation, like being picked up by a caravan. I've been working on a setting that is largely desert wasteland. I've included double the water requirements for those traveling through. When a PC no longer can meet water requirements, they must make a save. But, my rules aren't quite as harsh immedaitely. I have a short chart that the PC goes through if they fail their save. It starts with minor dehydration, major dehydration, disorientation, heat exhaustion, heat stroke/shock, then death. Each of these has various effects on attributes and hp's. If you are using encumbrance rules, PC's will have to start unloading unnecessary (maybe necessary) equipment. At any time they can reverse the effects with proper rehydration and rest. Once they experience heat stroke, they are unconscious (0 hp)and their only hope would be someone else offering aid. But this process would be over multiple days. Kind of a slow torcherous death is what I imagine for the unprepared caught in the desert and any one suffering from dehydration will be at a severe handycap if they have any encounters. Cool, sounds like we've approached the problem of making the desert feel like a desert similarly. I've got the escalating water requirements and you've got the escalating heat effects. If you have a lot of desert in your campaign I think your approach is probably better-- it gives more of a buffer for players before they die, as long as they are getting into enough situations to have to roll saves so that sometimes people will fail. Anyway, thanks for the comment it made me rethink my chart and I like this draft better. hmm, you have me thinking more on this now. The general rule is a person can survive 3 days without water. But there are stories of people surviving longer with minimal water and I generally assume PC's are a cut above the average. But, I might be softballing this. I may have to modify my approach as well. Great post. An excellent mini-game as usual. I'm wondering though if the water multiplier is necessary. Say a man needs 4 gallons of water a day for traversing the desert (http://alturl.com/8hspd). That's approximately 4 slots on your mule. So lets say a camel carries the same as a mule, and requires no water itself. If there is no multiplier it carries 7 days of water, if it carries nothing else. Throw a rider and a bit of luggage on top, and the players will need to look for an oasis around day 3 or 4, or risk dehydration. With multiplier, the camel will last to day 5. And your second camel will need help from a third to get your to day 8. Not counting luggage and riders. It just seems a bit much. Then again, you did say you wanted it to be tough. My other problem is that the simulationist in me has a problem with the rising consumption. Seems weird that people will have to gorge themselves on water towards the end. Thanks, a great comment. The problem is there aren't a lot of levers to attach to in old school D&D-- hit points, saving throws, movement rate. And none of them seem to fit the trope of the desert. It might not be as harsh as you think because I was thinking you go into the desert with normal water requirements and then the multipliers occur-- so in essence that four gallons a day requirement is like with the 3x or 4x already applied. If you have specific food and water needs set out for different terrain types already, which is probably a good idea, yeah it becomes crazy. Still, I was thinking of the cool water as more metaphor, not that players would need to guzzle down gallons and gallons, but that it is respite from the blazing sun. I guess another approach would be to make a kind of heat stroke meter, almost like dervishdelver was doing up above. The only problem then, is there is no way to plan ahead-- x number of days in the desert and everyone will be rolling saves versus heat stroke. It might help a bit that the camels can carry more than the mules, about double, so with a few healthy animals and some local guides, players should be able to make a couple weeks in the desert. I guess it depends on the starting water requirement. How much is in a wineskin? Hmm, I'll have to look that up. Lots of food for thought.